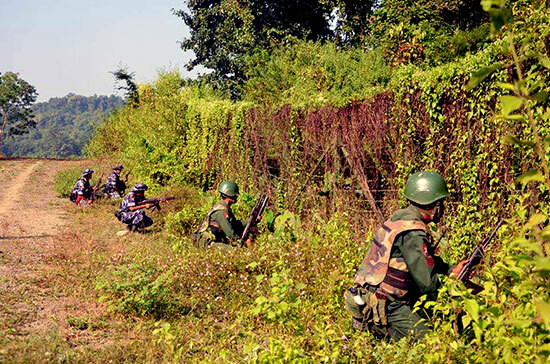 The police, Burma border guard police (BGP) and army have turned northern Arakan – Maungdaw and Rathedaung – in to a hell for Rohingya, crackdowns on innocent Rohingya civilians following attacks by unidentified assailants on three separate police outposts – the BGP headquarters, Kyein Chaung and Koe Tan Kauk- in northern Arakan on Sunday 9 October, according to Arakan Rohingya National Organization (ARNO) press statement on October 11. The joint forces are making Rohingya indiscriminate arrests, killing dozens of innocent villagers– including an infant child, and a 13-year boy — torching and plundering villages and homes, torturing everyone they see, and violating the womenfolk, the ARNO statement said. The authority has imposed from 7:00 pm to 6:00am as emergency law (Curfew) on October 9 at about 4:00pm by Maungdaw administration officer U Hla Myint, but most the Rohingya are not able to get the order as movement restriction and not announced to the rural area. Due to curfew order and imposition of blockade, the Rohingya in the area are facing acute shortage of food and essentials, the statement more added. These attacks must not be used by security and military forces as a pretext for a violent crackdown on the Rohingya involving arbitrary executions, mass arrests and further persecution of the Rohingya people. This already appears to be happening. These are criminal acts against innocent and must cease immediately, according to press statement of 14 Rohingya groups issued on October 10. On October 10, at about 8:00 am, Seven innocent Rohingya were tortured to dead and dozen innocent people were arrested in Myothugyi village of Maungdaw Township – three mile from Maungdaw and about 4 miles away from Kyikanpyin (Kawa Bil) village where some unidentified assailants raided the headquarters of BGP, they are;- Mohammed Ayas, son of Kamaal (13); Mohammed Husson, son of Kamaal (20); Mozu, son of Abdul Munaf (30);Nezam Uddin @ Dormin Daar, son of Ayas (35), were hailed from Myothugyi village and Nuru, son of Nazeer Ahmed (50); Nagu, son of Kadeer (60) and Nur Bosher, son of Younus (27), from Saung Pyaing Nya villag, under Myothugyi village tract for seeing out of the village, according to local villagers. 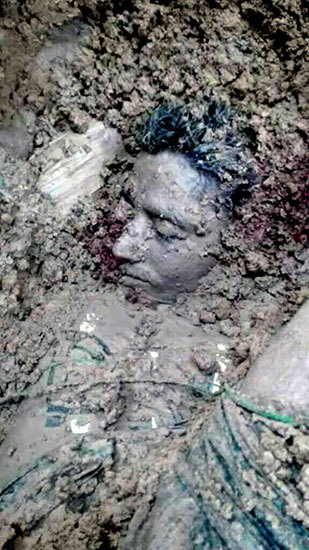 Similarly, three local Rohingya hailed from Kyaukpyinseik (Nari Bil) village killed by BGP and buried secretly near the village at night, but people recovered the body. “According to initial information, two police officers were killed, two others were injured and six police are missing,” said, Tin Maung Swe, a senior official within Rakhine’s state government and a second police source also confirmed the attacks, adding as many as eight policemen might have been killed, as well as some of the attackers. Twelve innocent Rohingya were arrested in Myothugyi village of Maungdaw Township on October 10 at about 8:00am after killing seven Rohingya. 54-Rohingya from Kyetyoepyin (Kyariprang) were arrested by joint force on October 12. Six Rohingya including village admin officer from Maungnama village were arrested on October 12, but no one know where about they- missing. BGP area number 6 personnel and army personnel arrested 10 Rohingya while they were returning to their home from market at noon. One house from Kyaukpyinseik (Nari Bil) village was burn down on October 10. One Mosque, one madarasa (religious school) and houses from Wabeg village of Wabeg were burndown on October 10. The village was burn down after attacking by army with rocket launcher motor on October 12. The joint force burned down Ngarsarkyeu (Ngasagru) and Kyetyoepyin (Kyariprang) on October 13. The dead bodies of Myothugyi village track were buried at graveyard of Yakub Mosque at midnight with the help of Hindu community without Islamic religious system. The next day the people recovered the 10 dead bodies and buried with Islamic way. Seven dead bodies were buried at west side of Maungdaw Buddhist cemetery -near the jetty- on October 13 at about 7:00pm, according to local people. The authority changes the plan to buried the dead bodies near Buddhist cemetery for not recovery as it is open to authorities. If the armed force used the Muslim graveyards, it is easy for Rohingya to recovered. Imposing the state emergency law, the people are not able to move one place to another, foods stuff are going shortage and price going to sky-rocketing. One sack of 50 kGs rice is 25,000 kyat which was before 20,000 kyats. Bangladesh border force – BGB- pushed back two wounded Rohingya- Kamal and Mohamed Yousuf on October 12, after giving medical treatment with suspect of attacker on border guard outposts. But, the two Rohingya who are ordered by village admin officer of Donpike village to take duty for night guard. At night, the on duty night guard exposed with their touch lighters which the Kyeinchaung BGP suspect as attackers and shoot on them. In their night post, five local Rohingya were taking duty. After getting, injured the two Rohingya rushed to Bangladesh for better treatment. Unlikely, they were pushed back to Burma and handed over to BGP. 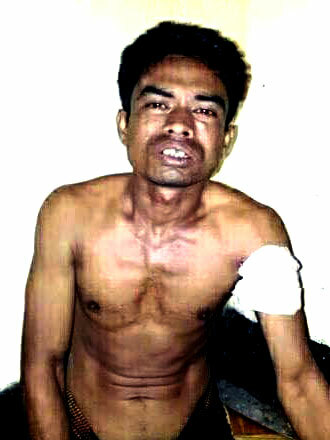 The village admin officer is trying to take out from BGP, but still the two were in the Kyeinchaung BGP outpost custody. Matthew Smith, founder of campaign group Fortify Rights, said restrictions on the Muslim population place made northern Rakhine State “a police state, an apartheid state”. The Special Adviser to the Secretary-General on Myanmar, Vijay Nambiar calls on the civilian population of the area to exercise maximum restraint and not be provoked into any kind of response by targeting other communities or religious groups. But, urges security force to exercise caution in the future to avoid any injuries or loss of innocent civilian lives, collateral damage to properties or any perception of harassment of the local population at New York on 11 October 2016. The UN Resident/Humanitarian Coordinator in Myanmar strongly condemns the violent attacks and killings in Maungdaw district. She is also very concerned about the unfolding situation and has conveyed this to the Government. The UN continues to follow the situation, urging that rule of law be fully respected, civilians be protected and all efforts made to deescalate tensions. The UN hopes this situation can be resolved quickly so that the people in Rakhine State can move forward the peaceful, prosperous and harmonious future they all deserve at Yangon on 12 October 2016. This entry was posted in English, News and tagged Arakan, Army, arrested, arson, BGP., Killed, Maungdaw, Police, protection, Rakhine, Rohingya. Bookmark the permalink.